Switzerland has room for further easing, though fiscal policy needs to be better utilized to boost long-term growth, according to the International Monetary Fund. The Swiss National Bank is using some of the world’s lowest interest rates and a threat to intervene in currency markets to stem appreciation on the franc. 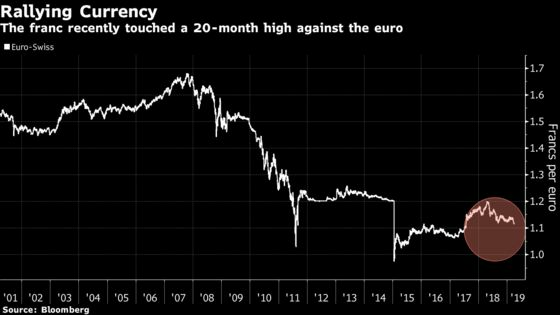 Yet even with a deposit rate at minus 0.75 percent, the franc touched a 20-month high against the euro last week as risk-aversion among investors picked up. “There is room on both fronts” if further easing is needed, IMF Mission Chief Rachel van Elkan said following a so-called Article 4 consultation in Bern on Monday. There is no predefined upper limit on the central bank’s balance sheet for interventions, but one wouldn’t want to increase it “much further,” she said, adding that as for interest rates, it wasn’t “ever knowable” in advance how far below zero they could be cut. Switzerland’s banks have criticized the negative interest rates for crimping profitability, and there has even been the suggestion that the SNB -- which has said it aims maintain the yield spread with the euro area -- could tighten policy unilaterally on the grounds that interest rate changes have very little impact on the exchange rate. Yet van Elkan said the very low interest rates indeed “discourage the attractiveness of the Swiss franc” and offset sustained pressure on it, while interventions were a good tool to contend with sudden surges. SNB Alternate Governing Board Member Martin Schlegel concurred that there was space for action. The IMF also called on low-debt Switzerland to boost its fiscal expenditure, on the grounds that when interest are very low, “fiscal multipliers are strong.” While the amount of additional spending under discussion isn’t very large per se, the deviation of actual growth from potential is growing, van Elkan said.